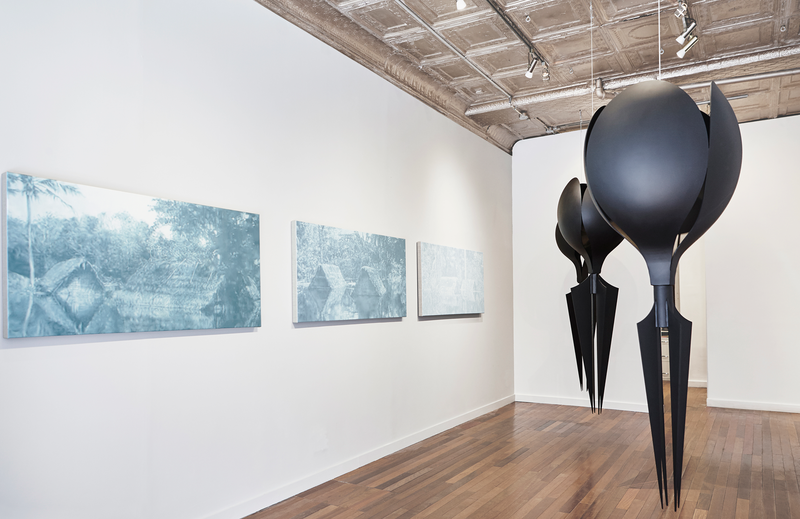 New York, May 15, 2015: C​atinca Tabacaru Gallery is proud to present a three-person show featuring artists Rui Chafes, Felix R. Cid, and Xavier Robles de Medina, who through sculpture, photography and painting consider the subject of man in relation to his environment. Each walk a tenuous line between the real and the surreal, presenting versions that are divergent, convergent, extraneous or inextricably linked. In the hands of Rui Chafes something as weighted and enduring as iron is transformed into a fragile and suspended form. 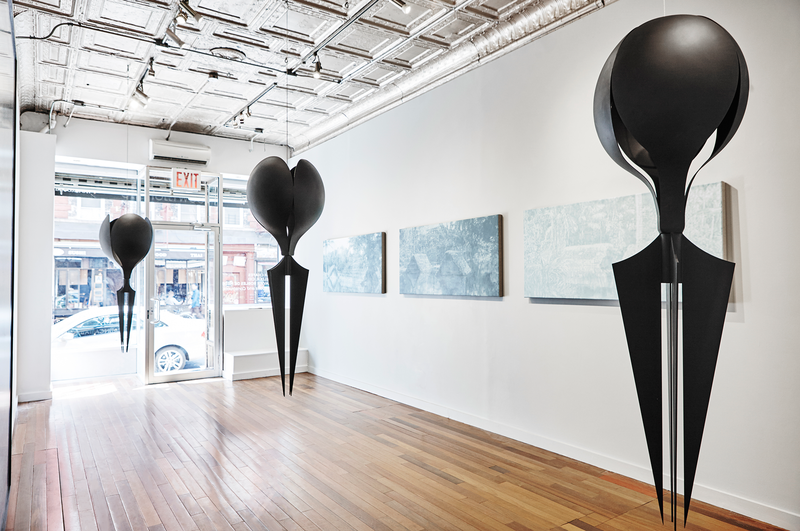 The three works exhibited here, and for the first time in New York, are part of his series of anthropomorphic sculptures dedicated to Giorgio de Chirico, capturing the illogical combinations and menacing figures of the late Italian surrealist painter. The term anthropomorphic is not used lightly, in part it is to note the formal reference to the mannequin heads painted by De Chirico in the 1920’s, but it serves also to acknowledge the works as surrogate or stand-in for the painter himself. 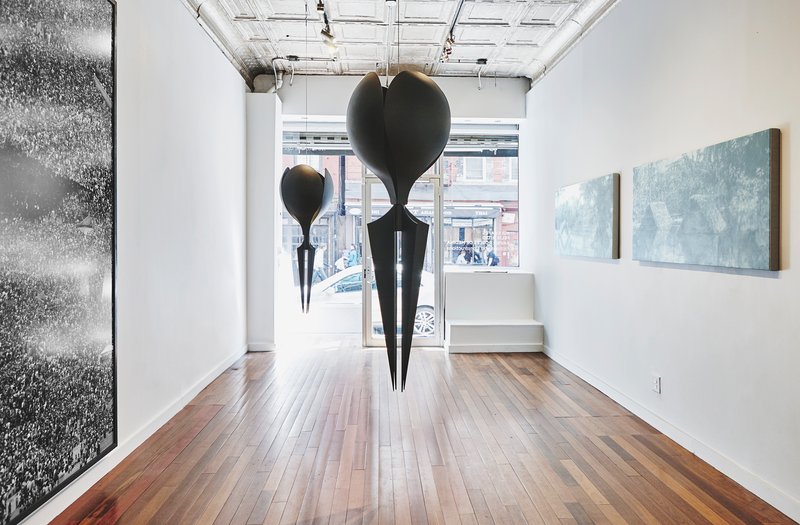 We cannot help but see the forms as compositions of heads almost severed from rigid bodies, eerily hovering in space, where black coated metal seemingly dissolves from solid to point. As objects in space they have a gravitational pull; the three beings fully inhabit and are interdependent of their surroundings, yet in their otherworldliness, take us through other dimensions. Chafes places emphasis on the physical to defy the acceleration into the virtual, and by manipulating mass, he demands from us silence and our uninterrupted attention in an age of instantaneity. 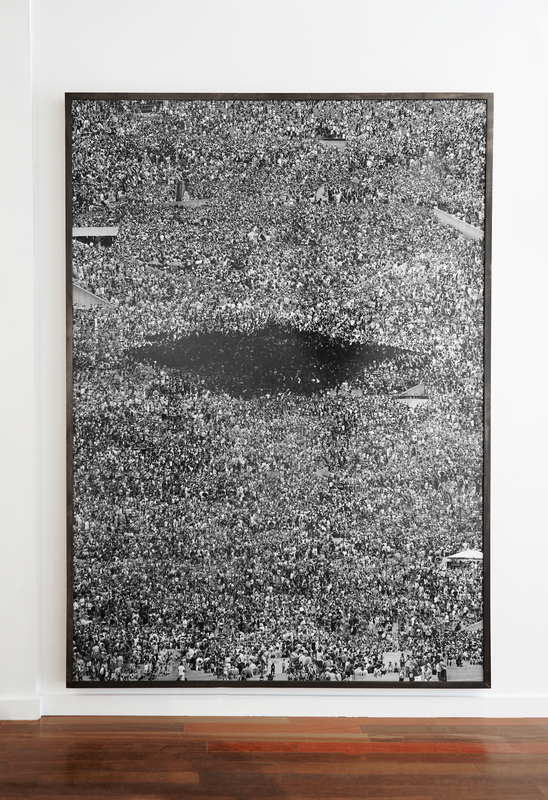 In a 1968 televised debate between authors Norman Mailer and Marshall McLuhan, McLuhan states: “The tendency of music in our time is to become environmental again.” On approaching the most recent series of photographs by Felix R. Cid, we are first confronted with an indistinguishable visual. Instead viscous grayscale striations pulsate with what we imagine to be engulfing sounds. 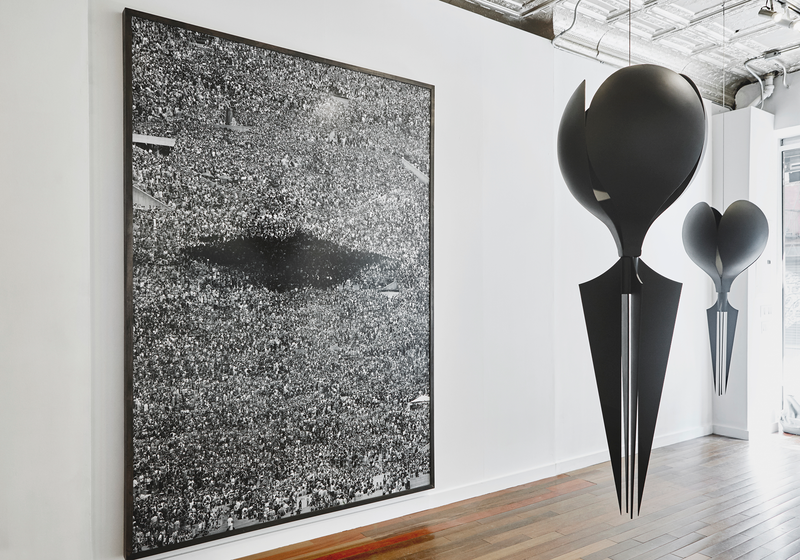 The density and entanglement of figures is compounded by the sheer size of the work – Untitled (Detroit) stands close to nine feet tall by six feet wide – where despite this size, from a distance one can only make out an ominous shadow without indicator of the structure responsible. Upon closer examination, the density is revealed to be massive crowds, which we ultimately understand to be documentation of a music festival. Within the mass of people, Cid offers relief in the form of architecture: temporary structures, steps, stadium-like seating. It is in these punctuations that we are finally clued into what might have been up for debate – the fictitious nature of the whole. The images have been collapsed in such a way that the various points in space and moments in times are conflated. It is a retelling of the event whereby the individual fragments are not limited to their original condition, but rather free to create a map of a world more akin to the active and current transformation taking place in the named city. Xavier Robles de Medina, the youngest of the three artists, seeks to uncover a reality that has been swept away by time – specifically narrowing his focus on video footage sourced from the creation of the Brokopondo Reservoir, built between 1961 and 1964. Located near the small town of Afobaka in Suriname, the construction of the dam flooded nearby villages, driving thousands from their ancestral homes. Frames from the archival footage have been captured in monochromatic paint, including the flaws and distortions of early video technology. We get a sense of the electric buzz from a television set with his choice of hues: a uniform acrylic base of turquoise green and titanium white that is exaggeratedly bright, which only enhances and penetrates the blue-greens more subtly incorporated in the upper oil layers. Robles de Medina acts as interpreter and restorer of the grainy source images, connecting and smoothing dead areas where information was originally lost through digital compression. What we see depicted are native huts shrouded by an expanse network of trees, all submerged and reflected in the extra-blurred waterscape. RUI CHAFES (b. Lisbon, 1966) graduated in Sculpture at the Fine Arts Academy in Lisbon in 1989. In 1995, Chafes represented Portugal at the Venice Biennial (with José Pedro Croft, Pedro Cabrita Reis) and in 2004 he was present at the Sao Paulo Biennial with his project Eating Your Heart Out, a collaboration with Vera Mantero. 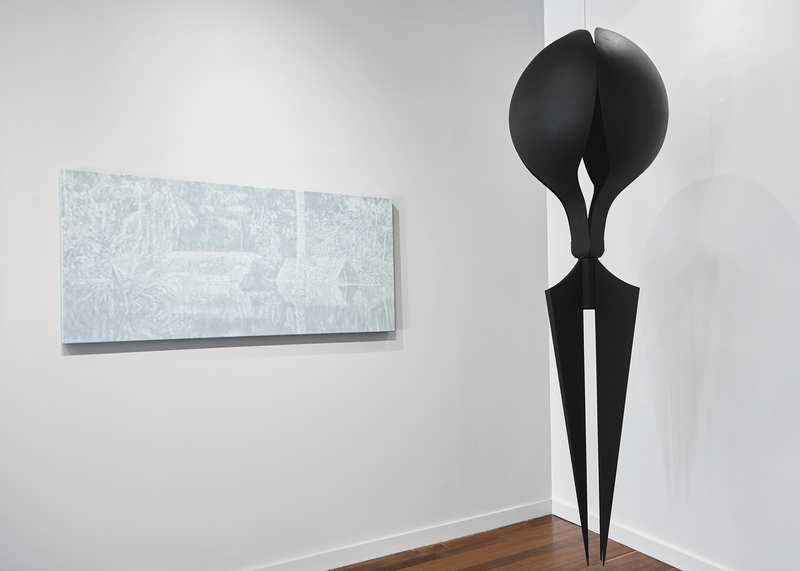 Chafes’ works can be found in the permanent collections of institutions such as S.M.A.K. (Belgium), Museo Reina Sofia (Spain), and Ellipse Foundation (Portugal). FELIX R. CID (b. Madrid, 1976) graduated from a GS program at the International Center of Photography in 2005 and he holds a MFA in Photography from Yale University School of Art where he was a nominated candidate of the 2012 Toby Devan Lewis Fellowship. 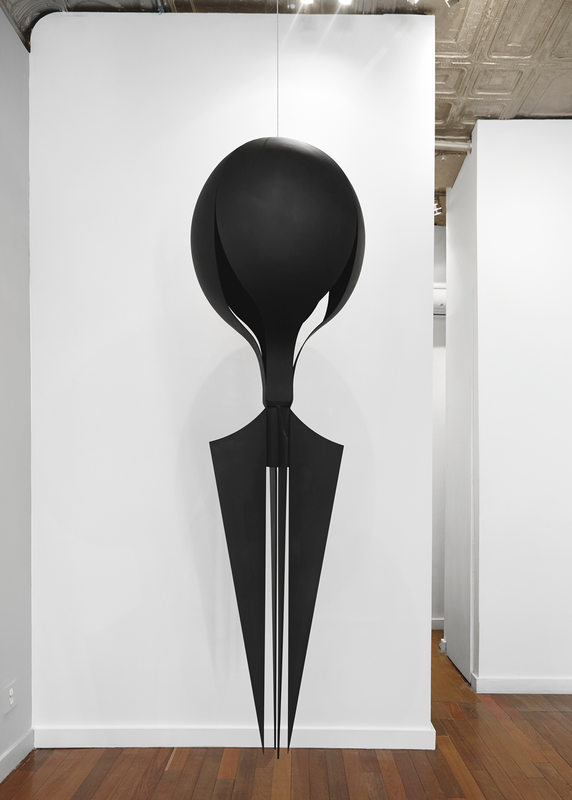 In 2012 he was a grant’s nominee for the Rema Hort Mann Foundation grant for an individual artist, and in 2013 he was a recipient of the Single Artist 2013 NYFA Fellowship and the Gregory Milliard Fellow. Cid is currently a fellow at AIM Bronx Museum. 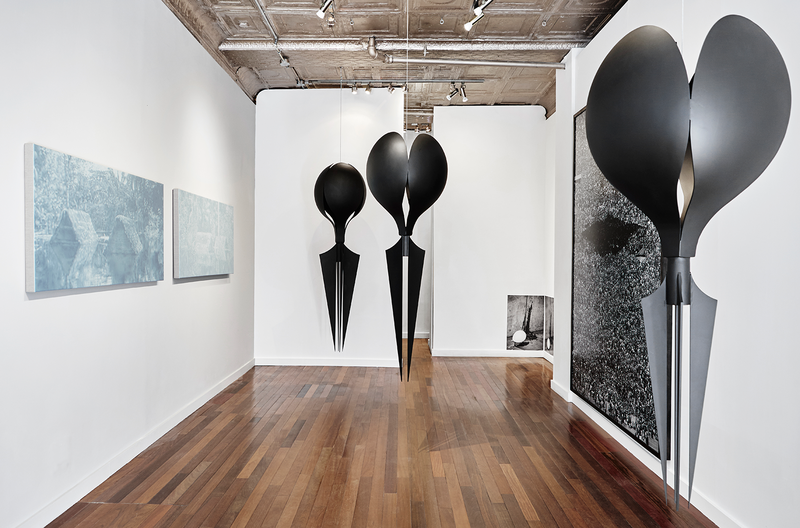 His works have been included in exhibitions in New York, Los Angeles, Madrid, London and Paris. He lives and works in Brooklyn, New York. XAVIER ROBLES DE MEDINA (b. Paramaribo, Suriname, 1990) received his BFA in Painting and Animation at Savannah College of Art and Design (SCAD) in 2012. Paramaribo is about a two hour drive to the Brokopondo Reservoir, the subject of his latest series of works. He is a nominee for the 2015 Prix de Rome Visual Arts. Robles de Medina lives and works in Amsterdam.